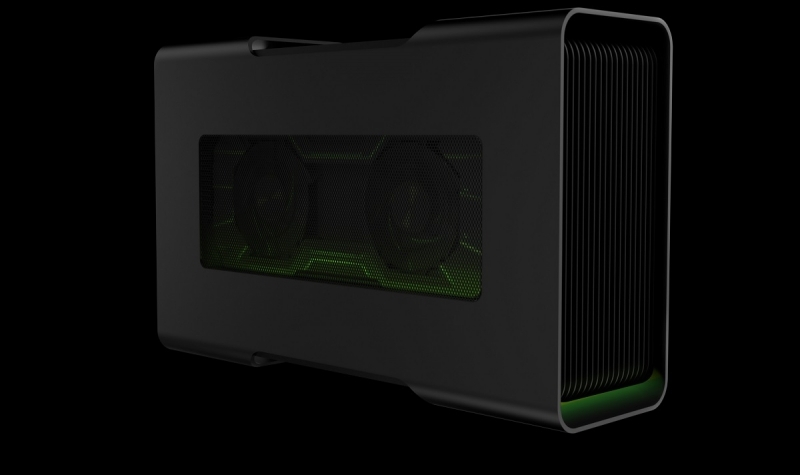 Razer has just announced the details of its Core external graphics enclosure which will let gamers bring the power of a desktop GPU to a laptop. Shipping in April and available for pre-order now, the Core will cost $499 if bought alone or $399 if purchased alongside a Razer Blade or Stealth. Any registered existing users of these laptops can get the Core at the lower price. While that amount does sound pretty steep, especially as you'll need a GPU and compatible laptop as well, Razer has pointed out that the Core is the world’s first plug-and-play Thunderbolt 3 external graphics enclosure. And, for those using it with a Stealth, it doesn’t just provide the laptop with a new level of graphical muscle, but it can also power the battery. The Core supports GPUs that draw a maximum of 375 W and are no larger than 12.20 inches x 5.98 inches x 1.73 inches. Inserting a card into the Core’s PCI-Express X16 slot is just like installing one in a regular PC motherboard, but no tools are required. While the Core is designed specifically for Razer’s Blade and Stealth, it should work with other laptops that feature a USB Type-C port equipped with Thunderbolt 3 - as long as manufacturers ensure that they’re compatible with AMD’s XConnect technology and the Core’s supported graphics cards. It’s this XConnect driver support and implementation that allows the Core’s seamless plug-and-play functions without needing to reboot the connected laptop. According to Extremetech, Radeon cards running software version 16.2.2 or later are capable of plug-and-play configuration with an external chassis. Nvidia’s cards will also be supported at launch (there’s a full list of all GPUs below), but they aren’t plug-and-play certified. Razer did say, however, that it is working to get all Core compatible cards to support the feature. Additionally, the Core also comes with four USB 3.0 ports, Ethernet connectivity, and two-zone lighting technology powered by Razer Chroma.